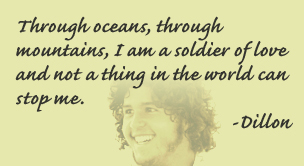 This connection part of the web site keeps the people that Dillon loved and touched together. Check in wherever you are, share your wonderful times and talk about when you just miss Dillon, and his friends and family will be there to listen. It will be an honor every time , for all those who love Dillon, to follow the lives of his friends and family for many years to come. If you experience trouble posting to this messageboard, please contact us at info@dillonslist.org. Please make sure to include as much system details as possible. Sending love on Dillon’s birthday. Our guys would be 29– who would they be and what would they be accomplishing? We can only imagine. You should be here with your parents and your sister-living life large. But, you are not here and everyday is a challenge that pushes us to remember your love and compassion. We are that 3 legged table that can never quite balance but work hard to not fall over. You would be 28 today…what a wonderful person you were. To be taken so young was a horror for all that knew and loved you. We still love you and use your memory to guide us Dillon. We are spreading your kindness around the world in honor of you. Numbers sometimes make no sense. What can it mean that Dillon passed ten years ago? Initially, you can’t imagine living a day without your son, then it turns into a week, then a month, a year and now ten years. And yet time goes on without our children. Thinking of Dillon — the bright light he was in our lives, and the bright light that he remains and will always be. Dillon, we love and miss you!